JUST-renovated garden level pad on terrific block, convenient yet quiet. Spanking new checkerboard floors, retro stove, flat screen TV, designer hard wood table and chairs. Spacious master bedroom with gloriously comfortable Ralph Lauren bed. 750 square foot space includes small bedroom with a sleigh bed and comfortable-enough-to-fall-asleep-on sofa. Find out why a New York Magazine cover story has declared Park Slope NYC’s 'most livable neighborhood.' “It’s blessed with excellent public schools, low crime, vast stretches of green space, scores of restaurants and bars, a diverse retail sector, and a population of more artists and creatives than even its reputation for comfortable bohemianism might suggest (more, in fact, than younger, trendier Williamsburg),” says MY Mag. Oh and I almost forgot Manhattan is minutes away: Downtown is about 20 minutes on the train, Midtown allow 30 minutes, Upper east and West side more like 45 minutes. Two subway stations that will get you there are the F train and the R train. About a mile away (and an easy subway ride) is the Long Island Railroad, an above ground train that will take you to East Hampton, and all the other Hamptons, ferries to Fire Island and etc. A twenty minute walk away are the Brooklyn Botanic Gardens, the Brooklyn Museum, Atlantic Avenue, the Brooklyn Academy of Music, better known as BAM and other adventures. When you book travel bear in mind I can't guarantee check in before 3 PM; check out is by 11 AM. While the apartment is on the garden level the back garden is not available for use. Come and enjoy good living in New York City! In my current career as an author and an artist I have written and illustrated two children's books, Cinderella (As If You Didn't Already Know the Story) and Thumbelina, Tiny Runaway Bride. Both were published by Random House Children's Books and were praised by reviewers for the New York Times as well as lots of young readers. I have had a one woman show of art work (in Park Slope where else?!) and two more exhibitions are coming up in the near future. The books are illustrated with cut paper silhouette images and pen and ink which are also the mediums (media?) I work with as a fine artist. My sensibility as an artist and storyteller are reflected in my home. I am a dual citizen of the UK and the US with roots and family in both. Perhaps that too shows up in the apartment along with some places I would like to go, like Morocco and the middle ages. .
We moved to the dreaded “outer boroughs” in 1989 for enough space to house a growing family. About a week later a light bulb came on in my head: It is better here. Life was sweeter, more civilized in so many ways. Here every building had its own personality, people smiled at one another, there were trees, gardens, history, a sense of community and continuity, all very reminiscent of Hamstead and Highgate the London neighborhoods where I grew up. Why then didn’t everyone move here? Since then everyone has. Particularly parents, writers, dog owners, anyone in the arts, particularly.... Well at this point particularly anyone who cares about their quality of life. Park Slope is no longer a place to go for more affordable space. It's where you move if you want a life. Twenty years later, divorced and with kids who have flown from the nest I can't imagine leaving. Where else could I go to the theater and be home an hour later warming my hands in front of the fire? My scaled down home is now a chic yet comfy springboard, I like to rent out for frequent travel. It has it all: high speed internet, a romantic garden, a working fireplace, a spunky bathroom, some whimsy, some grandeur, high ceilings, a great kitchen, a sculptural table hewn from a piece of mango and plenty of closets. What else is there?! The gorgeous NEW white bathroom has a shower and sink but note, NO TUB. ooh la la a heartland stove from Canada that cooks like a dream. Looking for a place to stay to visit your new grandchild? Want to consider moving to Brooklyn? On your honeymoon? You are going to love staying here. Elegant and very comfortable. Terrific location. This apartment was wonderful for a family vacation for me and my two children. The neighborhood is lovely, with many restaurants and shops within walking distance. Train stop just around the corner takes you into Manhattan in about 20 minutes. The only reason I did not give 5 stars is the fact that young children live upstairs and wake up early and energetically in the morning, making sleeping in a challenge. The owner thoughtfully provided a white noise machine and fans which helped. 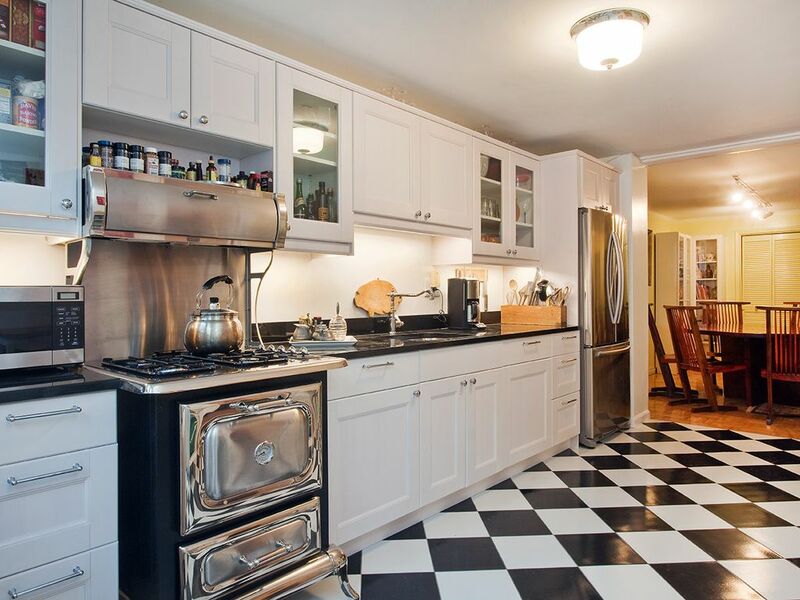 Overall, very clean, well-appointed and supplied apartment in Park Slope. We were in town for the birth of our grandson in Feb.'19. The VRBO is located 1/2 block from the hospital where he was born, which was very convenient. The queen bedroom is in the front of the house and the small,twin bedroom is in the back off the kitchen area, right besides the bathroom. The laundry is down a flight of stairs off the hallway, which was very nice to have, since my stay was 14 nights. The kitchen has everything you would need to cook dinner. Many places to eat 1/2 block up the street on 7th Ave. or 2 blocks down on 5th Ave. Parking is VERY DIFFICULT in the area. Would recommend not coming with a car. Everything was well appointed. Truly enjoyed my stay. Very nice convenient apartment close to grand kids. We enjoyed our stay. Clean, great shower and comfortable bed. This two bedroom apartment was perfect for our visit. The apartment was clean and spacious. Barbara was so helpful and responsive to any questions we had. She even sent us a forgotten item the next day. Highly recommend this apartment for anyone visiting NYC. Lovely apartment in a great location. Well-situated to explore Park Slope and Manhattan. Had everything I needed for a week's stay. Brooklyn is the new center of New York City! The new mayor lives four blocks away. Come and check it out. Change over days means the cleaner comes Wed from 11-3; exceptions can sometimes be made. Yes there is a washer dryer. Beginning September 2014 the garden in back will not be available to guests.